Chrome's immensely useful Web Inspector has a timeline feature that displays, among other information, when certain events happen in a page's lifecycle. These events are represented by tiny vertical stripes on the timeline's x-axis. The blue and red events are the DOMContentLoaded and Load events, but what about the green and orange ones? I couldn't find any reference to them online. And to be fair, they don't seem to be available in the stable version of Chrome. I'm not sure in what version they were added, but they're certainly present in Version 33.0.1750.5 dev and above, because that's where I see them. Press Command+Option+i (Ctrl+Shift+i on Windows) to open DevTools. Press Command+Option+i again on this new window. That will open the DevTools on the DevTools. 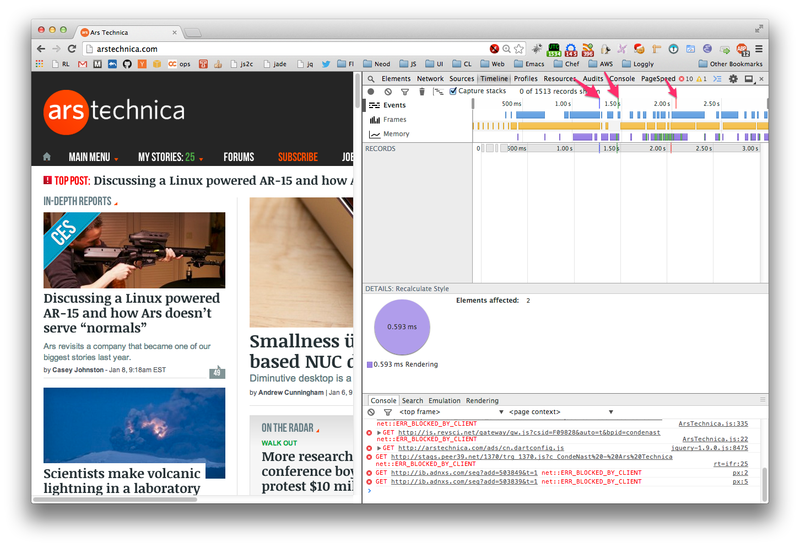 You can redock the page's DevTools if you want. If it's not already, select Elements — it's the first icon at the top of the inspector. Once you do that, you can see that these event stripes have title attributes. Unfortunately, the events are covered by other UI elements, so mousing over them does not display the titles as tooltips, as it should. So what on earth is "CSI/tbsd_"? Googling led me to a couple of not so useful results. <wjb> paul_irish: Why does a console.time timer name end up as the title of a timeline event? So it's a convenient shorthand for the Chrome team to profile something in the page lifecycle — who knows what. So far, it only seems to appear on pages with Google WebFonts, so it might be related to loading those.